Ibrahim Moustafa is best known as an artist in the comics industry, breaking out with his work on the Eisner Award-nominated High Crimes miniseries and recently earning gigs on superhero books like Doctor Fate and Mockingbird. 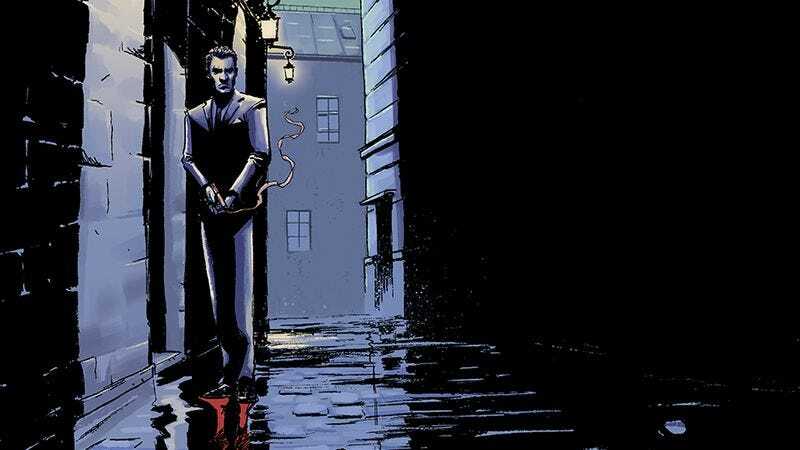 Moustafa’s new Stela digital series, Jaegar, sees him stepping into the writer’s role for the first time, and the story has more in common with the grounded, suspenseful High Crimes than his more fanciful superhero projects. Set shortly after World War II, Jaegar follows French-Algerian spy Idris Morel as he hunts down escaped Nazis that forged their death certificates, and his officially sanctioned mission ties in nicely with his personal goal of taking out the Nazis that tortured him when he was a prisoner of war. This preview of this week’s Jaegar #2 takes Morel to Rome, where he’s searching for financial records that will bring him closer to his Nazi prey. Moustafa amplifies the tension of his story with his high-contrast visuals, and panels like Morel walking through the heavily shadowed hallway or hiding in the darkness around a corner evoke a noir atmosphere that adds extra style to the narrative. Moustafa’s storytelling is very clear, best exemplified by the moment when Morel finds out where Bishop Althaus is keeping the records he needs. Moustafa conveys all the necessary information in four silent panels: the first zooms in on the bishop’s eye to indicate that they’re the key clue, the second and third pull away to show what the bishop is looking at, and the fourth shows Morel’s face making the conclusion that dictates his next course of action. Readers can discover more about Morel’s Nazi hunting when Jaeger #2 hits the Stela app on Thursday, and the first chapter is currently available for free for anyone that wants to give the series a try.